« New lizard enclosures in China! The Lizard Lab has experienced a first this past year, with an honours project on the chemical communication in snakes, wrapping up this past April. The project has generated some excitement, both positive and slightly hesitant, with lizard enthusiasts coming to terms with the unusual lack of limbs. 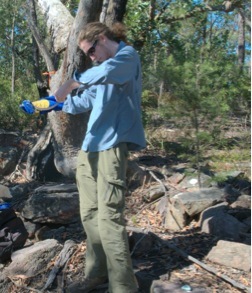 But with the blessing of lab PI Whiting, and in conjunction with the University of Sydney, this project has found a place in the hearts of all Lizard Lab members, who have at one time or another, offered a (gloved) hand. 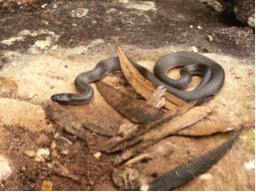 A small-eyed snake, found beneath a flat rock. 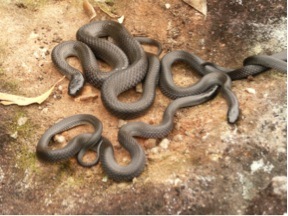 The beast in question is the small-eyed snake (Cryptophis nigrescens). Not a household name due to its nocturnal nature, but is commonly found along the east Australian coast. In the winter you can find them in crevices and under medium sized flat rocks, along cliffs and rock escarpments. Snakes are often difficult to work with because they are hard to find and hard to collect in large numbers, but because small-eyed snakes are common and reliable to find, they are a great study species. If only the dirt roads were as reliable! On one field trip collecting snakes we were majorly bogged and it wasn’t until nightfall that we were rescued. The snakes we collected only stayed with us for a short time before we returned them back to their homes. Small-eyed snakes are mildly venomous, with one fatality on record, and my goal was to keep it that way! 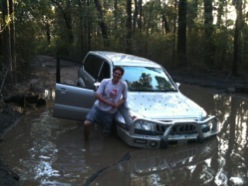 Ben on one of our field trips, after we sunk the car. It is the long held opinion that snakes are not very ‘social’ animals, that is, they don’t interact with each other an awful lot. This is probably due to the fact that we don’t see them interacting. Many snake species are cryptic and secretive, which is why it is so intriguing to discover what they get up to. Chemical communication (smell) is very important for many reptiles, and especially a nocturnal species with reduced eyes. Snakes smell with their tongue, flicking it through the air and picking up particles on the tips. It’s an environmental sampler and delivery device: delivering these particles to an organ in the mouth for processing (the vomeronasal organ). Do small-eyed snakes change their behaviour when they smell other small-eyed snakes? I asked this question by giving a small-eyed snake the choice between two scented refuges. The snake has a preference for a scent if it spends more time in one scented refuge over the other. – In general, small-eyed snakes follow the scent of other small-eyed snakes, and they discriminate between male and female scents. – Males specifically prefer a larger female’s scent, probably because larger females have more babies. – Male snakes discriminate between males of different size, preferring smaller male scent. One amazing thing about small-eyed snakes is that males engage in contests with each other in order to mate with females. These fights don’t involve biting, but are ritualised and can involve entwining and head jousting (see video below). Two male snakes fighting: The one at the top of the screen is slightly bigger, and is the winner of the contest. I found that longer snakes with wider heads (relative to head length) won contests. Male snakes can tell the size of a rival male just from the chemical scent. Therefore, males can settle a contest in the dark without even being in physical contact. The most important thing about lab trials is that you confirm what you discover actually happens in the field. One of my supervisors, Jonno Webb, has been turning rocks looking for small-eyeds for the past 20 years (and the grey hairs and starting to show…). I helped with the surveys last year, and now looked to see if my lab results added up. Two or more males under the same rock were rare; in fact it only ever occurred once in 20 years of data. Most likely males don’t tolerate being near each other, and after a fight one is displaced. If a male was in a group of one or more females, I assumed that he was successful in mating. So I compared grouped vs. solitary males, and found that group males were more likely to be longer and have wider heads (relative to head length). Females in groups were also more likely to be longer. Small-eyed snakes prefer to group with each other under rocks. So the story was confirmed. Longer males with wider heads beat up smaller rivals, gain access to groups of big females, and are reproductively successful. Competition between males has driven sexual selection, where males are now overall bigger than females. This project has definitely been an exciting time for me, and couldn’t have been achieved without support from Martin Whiting and the Lizard Lab team (Mac Uni), and Jonno Webb, Rick Shine and the Shine Lab (USyd).